I recently joined some other members of the press and the My.com community team, as we took a guided tour of Conqueror’s Blade as it looks now. We were free to ask questions about the mechanics, the cosmetics and anything else that struck our fancy. I had not had the opportunity to play Conqueror’s Blade yet, but I am familiar since I’ve seen a lot of gameplay and news in my tenure at OnRPG. Their previous tests were focused on sieges/army battles, where you learned/focused on the siege weaponry and the actual battle itself. 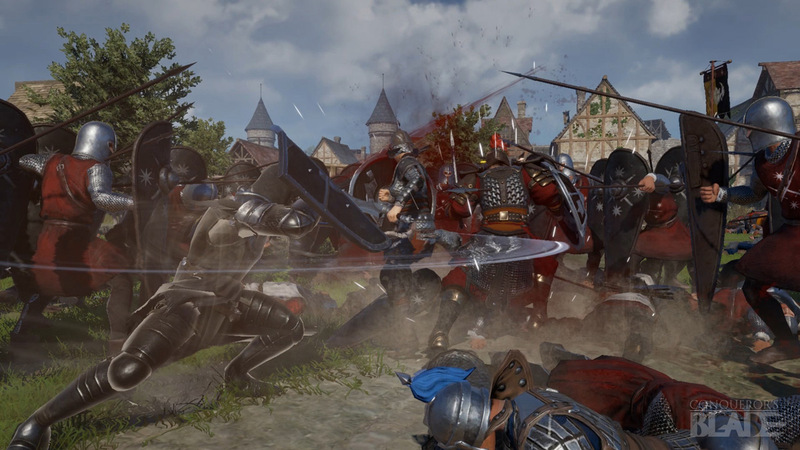 This preview however, was focused on going into the actual world itself, showing off the MMO features that make Conqueror’s Blade stand out from its competition. 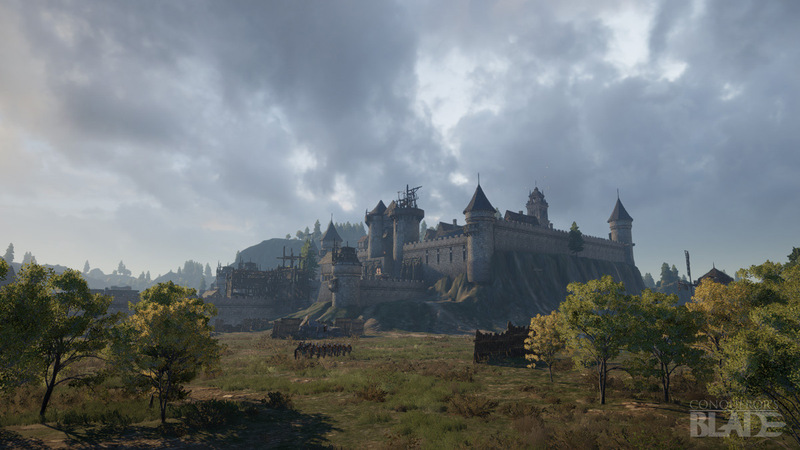 It’s not the first Castle Sieging MMO, but it might just be the prettiest and most complete. It is primarily a PVP game, as it might imply, but I am grateful that there are ways to approach it for people who want to either PVE or not form under one banner. Instead, they can choose to focus on gathering, crafting, or act as a mercenary force, and use your army for the highest bidder. There’s a big social element to Conqueror’s Blade, so this should make all playstyles possible. But they took us to the very beginning, with showing off the character creation engine. Several regions/ethnicities were represented, as are a variety of weapons styles. The major focus is on Kingdom Building, but in this Medieval setting, it’s not all white Europeans, which I certainly appreciate. 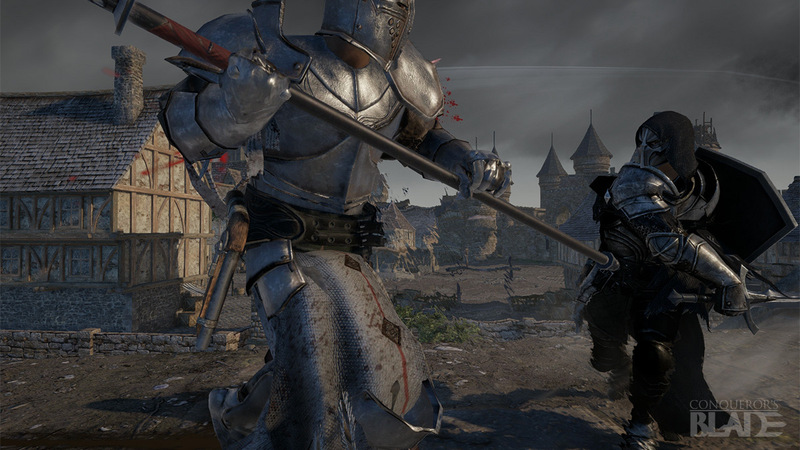 There are plenty of games where the focus is Medieval combat, but none that are a living, breathing world, and that’s their ultimate goal here. The player is a “Warlord” that they take into the world. One of the things about character creation that I found fascinating, is before you go too deep, you pick your Nationality. This will help communication/forming groups with other players since you would likely gravitate towards people of your nationality, or at least, people who share a common language (or one of the languages you grasp). They want to have one massive server, and if you can see someone’s nationality, you may want to stick to people you can easily communicate with. What I would like to see though, is what Final Fantasy’s MMOs did, in the auto-translate system. There are a few cultures players can pick from right now, in a few European nations, and Asiatic countries. Next up, they plan on adding Vikings. Then you go into Weapon Specialization, which is very important. Right now, there are 10 specializations currently available. But you don’t have to keep rerolling if you want to learn/utilize another style. As you progress, you can learn more weapon specializations, up to six specializations by the end game. This will offer some tactical choices for you, so you and your friends can swap styles and compositions around to throw your enemies off balance, or simply to do something different. They showed us the game from the perspective of a level 60 character, who had some very shiny/gorgeous Templar armor. This brought me to one of my questions, as he talked about cosmetic changes to armor, where you can purchase skins for your gear. One of my fears in any free to play MMO is the nature of “pay-to-win”. They assured us that this western team at My.com has direct input and wanted to make sure to steer the game away from that as much as possible. These cosmetics are just that and do not offer statistic bonuses. They did discuss a Premium Account feature, but that would merely be exp bonuses, things of that nature, instead of hard stats to make you stronger. There will be an extensive tutorial that shows everything you need to know before entering your starting hub (which we did not see). There was not enough time for that, they were instead focused on showing us the game itself, which I appreciate. There is a neutral hub you start at, that has a few castles and cities to explore. They didn’t want to just throw them right into the violent mayhem of the game, so they would instead be able to learn and grow, instead of being immediately put against powerful foes right at the start (but this could change – this is in development after all), and they also discussed the proprietary game engine (The CHAOS Engine), which allows the game to be displayed and played in their own vision. They also showed the UI, which is very clean, and easy to navigate. One thing that I thought was neat was that you can see your Warlord’s career and skills, to see how far you’ve come. There are presently 10 skills you can master, but you can take three into battle (and an Ultimate). This ranges from offensive, defensive, healing abilities and more, so there’s plenty to think about and no wrong way to go about it. We also saw the “Unit” tab of the UI, which displays the units you have, and units that you can gain access to, from Militiamen, Pikemen, Archers, the Polish Winged Hussars, Spearthrowers, Arquebus wielders, and the Knights of Malta. Each unit represents a medieval culture from around the world. Once you’ve unlocked a unit, you can also go through a skill tree for them too, adding yet another layer of customization and tactical possibilities. It’s an investment to build an army, but you don’t have to spend hours upon hours before you can even play the game. The “J” keybind will take you to a series of PVP/PVE options where you can dive right into battles, and it will take 15 players per side and pit them together. But you can also round up your crew, and ride into the actual world, to fight bandits, other players, and poke your nose in business that may or may not be any of your concern. That’s another cool feature, is if there’s a battle going on and you see it in the open world, you can decide that you want to interfere on behalf of whomever. Perhaps you can even decide to take on both forces? Now that would be interesting. A very Date Masamune approach to conquering. One of the failings some games like this had, was that you had a fortress in the world, and it must be defended at all times, turning the game into a job. Right now though, you can only be challenged and attacked on one or two days a week, at x-hours. So you set up a time that is good for you and prepare to be sieged if you’re worried about it. I love this feature because they realize that people have real lives and things to do outside of the game. 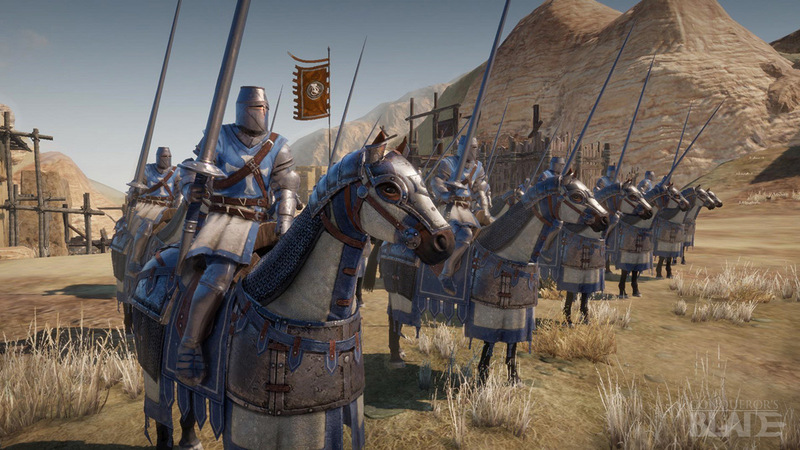 You can set up NPCs/armies to defend your holdings though. When going into the world, you switch from a traditional MMO camera angle to the top-down RTS/Turn-Based camera. This is so more players can be visible at one time, and the Chaos engine can render up to 1,000 units at one time, but the open world will have way more than that. This is the reason for that top-down camera. 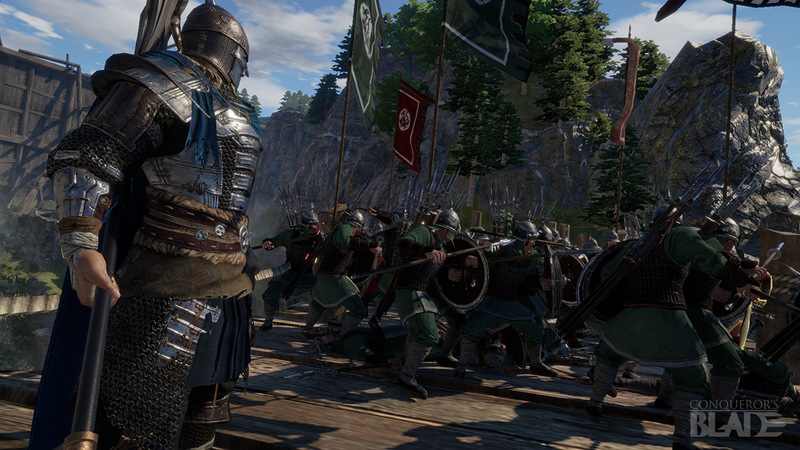 You will see your Warlord, your units as well as the Mines, Bandits, other castles, and more. There’s a lot going on in battle, and it is also not tab-target based, going instead for skill-based and hitboxes. If you hit the enemies arm, you hit them, but if you hit their shield, it will soak some of the damage. 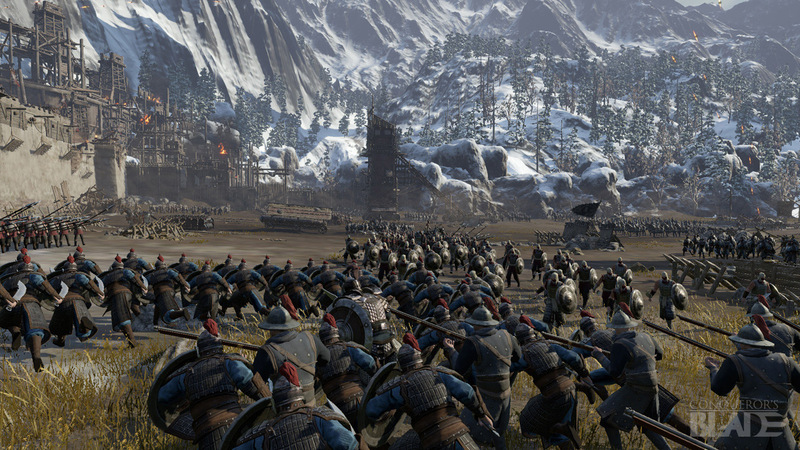 Combat looks intense and also skill-based – just because you have great units doesn’t mean you can win with them. You can certainly be outplayed with units that counter yours, skills that you are weak to, or simply get out-thought on the battlefield. Thankfully you can retreat out of a battle if you need to. Also bear in mind, that if you lose a piece of artillery, or a unit dies, that is gone forever. So you really have to pick and choose your battles carefully. Otherwise, you spend a lot of time healing wounded units, reequipping freshly trained units, et cetera. It’s also important to note there will be a wipe, so players who are playing all the time in tests aren’t going to have a giant advantage. There will be a possible head start with the Founder’s Packs (a few days early). Honestly, this is a style of MMO that I don’t get into easily because investing tons of time and being obliterated is very draining, but I like what they have on offer in terms of not being destroyed when you’re asleep. I like the idea of being able to be an arms salesman/mercenary, and perhaps that will be my role when this. 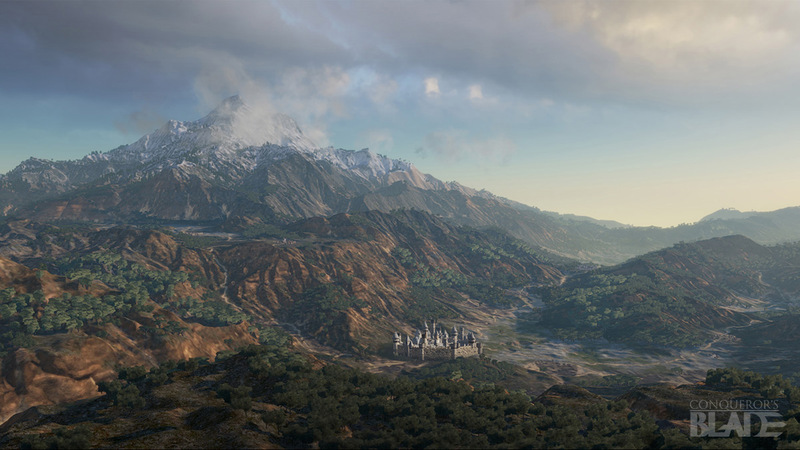 It’s a very ambitious project, and it could be the freshening up the MMO scene needs.